Why Do I Have a Unibrow? It's no secret that some gals grow excess hair between the eyebrows. Most often, stray hairs on the face are a harmless trait that runs in the family. (Hi, Mom!) Plucking or threading can clean up your look for a few weeks. For lip or chin hair, a depilatory cream for the face is an option -- kept well away from the eyes. Laser hair removal and electrolysis are long-term solutions. A pinch will show lumpy skin on just about every woman. Cellulite is just a normal fat layer under the skin. Exercising to firm muscles can sometimes make it less visible. Doctors question whether special cellulite creams really work for long. For a quick fix before slipping on shorts, rub on a self-tanner. Cellulite is less noticeable on darker skin. Cosmetic procedures are another option. Why Do I Blush So Often? Most people blush sometimes, especially when feeling shy or embarrassed. But when patches of red pop up randomly on your cheeks, forehead, or chin, rosacea may be to blame. If that's the case, see your dermatologist. There are pills and creams that can help. Use a broad-spectrum sunscreen every day, as sunlight is a trigger for the flushing of rosacea. Rarely, frequent blushing and a pounding heart in social situations can be an anxiety disorder. If it harms your work or relationships, talk to your doctor. Surely, I'm Too Young to Go Gray! 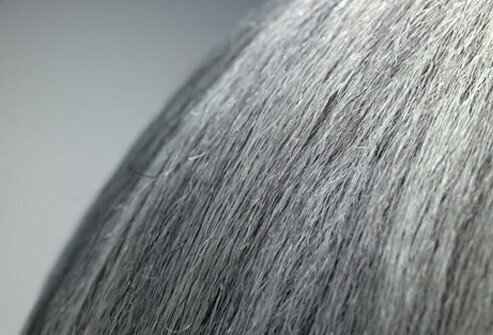 If you are under 40 and more than half of your hair is white, you're "going gray" prematurely. Rarely, this can be a sign of a thyroid or pigment disorder. But most often, you can thank your parents for the early gray genes. Coloring your hair is an easy fix. If you want to embrace your silvery locks, special shampoos can prevent yellowing. Premature gray does not mean you're aging more quickly than normal. Are Those Pimples on My Bottom? Probably not. Small white or red bumps on your rear are most likely keratosis pilaris. 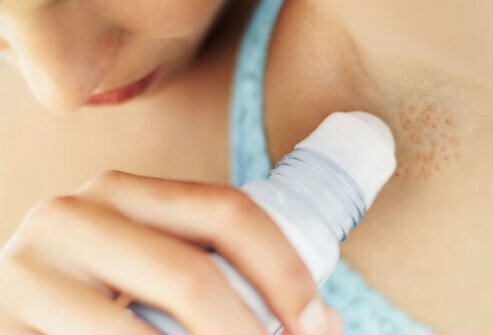 This is a harmless skin condition that can also show up on the back, cheeks, upper arms, and thighs. The condition may last for years, but tends to go away gradually by age 30. Until then, moisturizer may help applied several times a day. When the skin gets stretched by pregnancy, weight gain, or the normal growth of the teen years, depressed lines can develop. 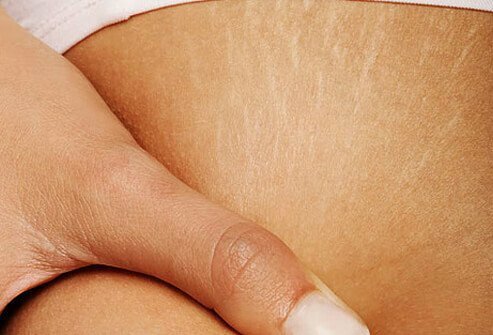 These stretch marks are a type of scar, which is usually red or purple to start, then fades to a glossy white. They're most common on the belly, thighs, hips, breasts, and lower back. 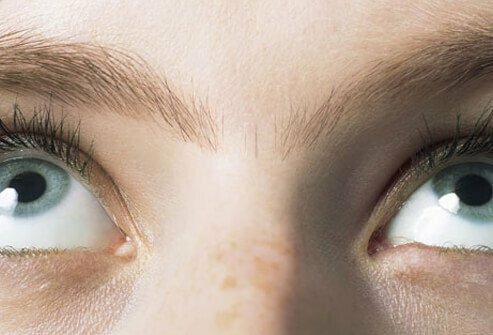 Chemical peels or laser surgery can reduce them. Unfortunately, lotions and creams usually don't do much. You brush your teeth twice a day and floss daily, yet you still have a bad taste in your mouth -- a sign of bad breath. Gum disease, heartburn, dry mouth, or even a sinus infection could be to blame. But most likely, your diet is the reason. Toothpaste is no match for heaps of onions and garlic. 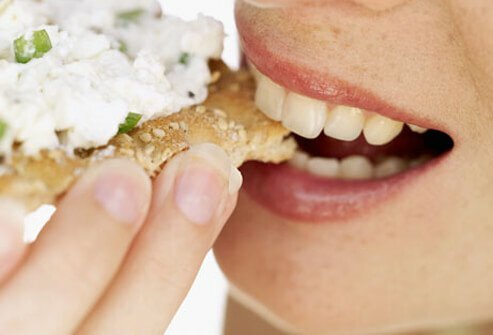 See if avoiding these foods helps. If not, check with your dentist. Is There a Fix for Razor Bumps? Razor bumps show up when stubble curls back on itself and grows into the skin. The best fix is to stop shaving. Smart shaving habits might help prevent the bumps. Take a hot shower first. Use a thick shaving gel and a sharp, single-blade razor. Shave in the direction your hair grows. Hair removal creams and laser hair removal treatments are other options. What's Making My Teeth Dark? If you drink coffee, tea, dark sodas, or red wine, you have your answer. Smoking and some medicines can also discolor teeth. The first step to whiter teeth is to brush and floss regularly. Teeth-whitening systems can also help. You'll find them at the drug store and in your dentist's office. Most people have calluses on the heels and balls of their feet. The thick layers of dead skin are there to protect your feet from the pressure of walking. But you may not like the sight of rough, yellowish heels peeking out of your sandals. Soak your feet in hot water and scrub with a pumice stone to remove some of the dead skin. Glycolic acid lotions and creams also help soften calluses. Why Do My Nails Split and Fray? If your hands are often in water -- especially if you use strong soap -- your nails may split, peel, or become brittle. Use a moisturizer and wear gloves when washing dishes. Over-the-counter supplemental Biotin tablets (5,000 micrograms daily) also help strengthen your nails. A fungal infection could be the problem if your nails change color and then break or crumble. In that case, you may need prescription pills or a nail lacquer from your doctor to treat the infection. Original (amber) Listerine soaks also help dry up nail fungus. Sweat cools your body so you don't overheat. If you tend to sweat while sitting calmly in a cool room, talk to your doctor to find out why. One possible cause is hyperhidrosis. It's harmless but annoying, and it can cause pools of sweat under the arms and on the palms and soles of your feet. Prescription antiperspirants, pills, or even Botox are treatment options. Help, I'm Losing My Hair! 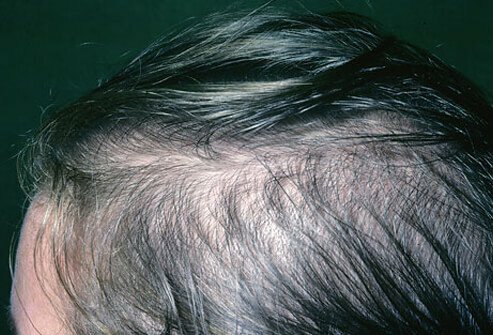 Hair loss in women is more common than you might think. Women make up 40% of people with hair loss. Some of the most common causes are hormone or thyroid problems, pregnancy, and certain medicines. A doctor may prescribe medicinal foam to rub into the scalp or pills to address hormonal problems. Even if you shower regularly, foot odor can be stubborn. The soles of the feet are a favorite hangout for odor-causing bacteria. When sweat mixes with the bacteria, you get that familiar foot stench. Keep feet dry and don’t wear shoes that make your feet sweat, especially tennis shoes and boots. Wash socks after every use. Still have stinky shoes? Try a deodorizer. How Can I Soften Chapped Lips? Blame dry air for your peeling lips. It can cause tiny cracks in your skin, making them sensitive as well as rough-looking. Don't lick your lips -- it only makes them more chapped. Instead, use a lip balm made with petroleum jelly, castor seed oil, or shea butter. This will seal in moisture and protect lips from the elements. And look for one with SPF 30. The sun's damaging rays can dry your kisser even more. Are you a teacher, a nurse, or a sales clerk? Women with jobs that keep them on their feet are more likely to develop spider veins. Obesity, pregnancy, and genetics also boost your risk. 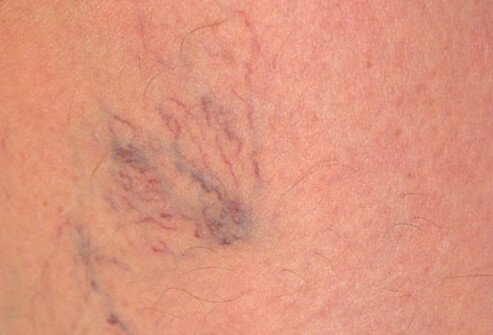 Spider veins usually don't need treatment, but you don't have to live with the look. Sclerotherapy is one option, which involves injecting saline or sugar solutions directly into the veins in a doctor's office to make the veins fade away. Usually several sessions are needed, 6 weeks apart, and support stockings are recommended for at least the first week or two after each treatment. Support stockings help prevent the appearance of spider veins in the first place. 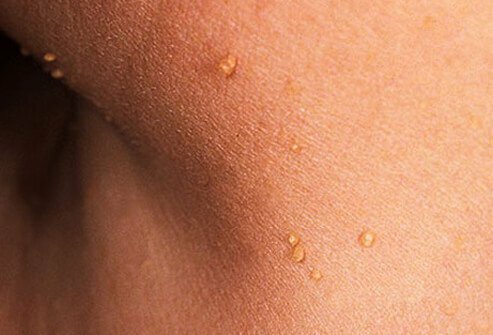 Should I Worry About Skin Tags? Skin tags are tiny balls of tissue that sprout along the neck, chest, back, armpits, and upper thigh/groin area. Overweight and elderly people get them most often. While they occasionally become irritated, skin tags are not dangerous. 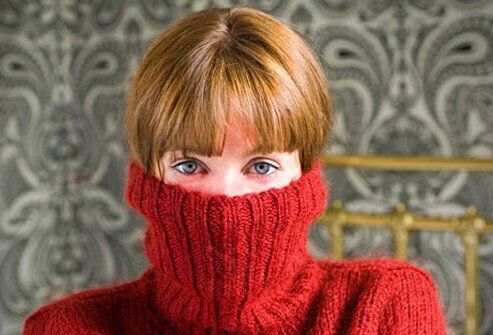 If the appearance bothers you, a dermatologist can remove them in an office visit by freezing, snipping, or burning them off. What Makes My Neck Age So Fast? If you've lost a lot of weight, you may have extra skin hanging around the neck. Or as you've gotten older, your skin has thinned, you've lost some underlying collagen, your muscles have loosened, and maybe you've gained a double chin. 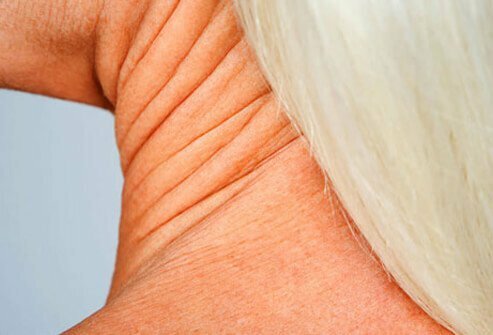 It can all add up to deep neck furrows ... and your neck looks older than your face! Slow down and reverse some signs of aging by avoiding the sun and using sunscreen daily. Botox injections, topical prescription retinoid creams, lasers, and broad-band light devices can also help. For a more dramatic change, a neck lift is also an option. Compendium of Continuing Education in Dentistry. Journal of Drugs in Dermatology. New Zealand Dermatological Society, Inc.
U.S. Department of Health and Human Services Office on Women's Health.